This is all I can say that I accomplished today. The Christmas tree is put away for yet another year and our house is slowly looking back to normal. I had a twinge of sadness putting the tree away as I found the holiday just came and went a little too fast for my taste. Don't get me wrong I am happy to be done with all the holiday "stuff". But it zoomed by so quickly. Now we get to move onto birthdays & a baptism in just a couple weeks. Tomorrow I hope to get one of Brinley's baptism items checked off my list. I'll be sure to share. Your pictures are always so gorgeous. Seriously. Also, those snowflake ornaments are amazing -- especially the red and white ones. And we took down Christmas yesterday, too. Last year we took it down on Christmas night. I enjoyed having it up a bit longer, but I was really happy to get it all down, too. Hope your next month of busyness is full of lots of joy, too. Baptisms seem to be just that. I agree that it went by so fast! I'm glad to have all my stuff put away, but now my house seems so bare :( Just like you I have a little ones birthday and a baptism at the beginning of Feb! So exciting...Hope yours is wonderful! I loved your Christmas tree this year. It was fun to see you cute little boys at football state. You have a sweet family. you make putting away Christmas decorations look so pretty. well done! Still cleaning and packing up Christmas things here too. I had carried down 5 buckets as I was coming up the stairs but daughter greeted me with "I have an idea for my birthday!" ♥ Very nice! I was glad to get mine put away also, it did go by fast! I can't believe Brinley is almost 8!!! It seems to pass too quickly. Hope all goes well with the baptism and the things you need to prepare. Look at your organized totes and stacks. Did I tell you that I moved? 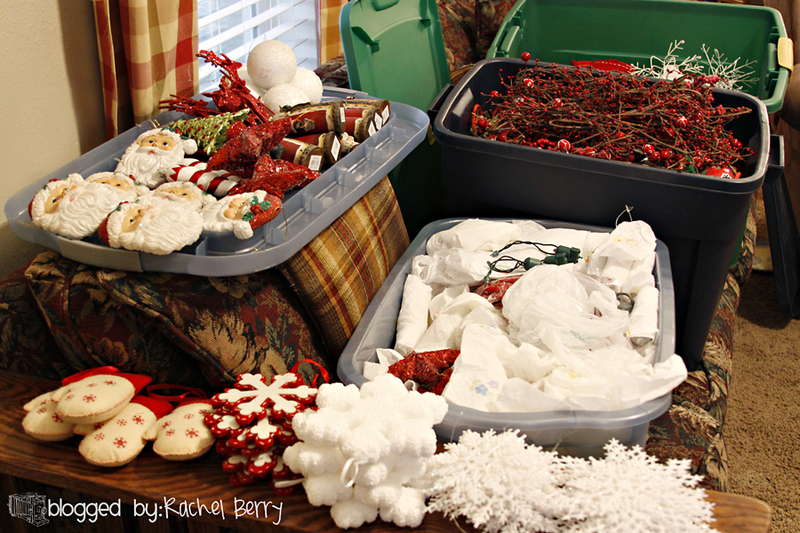 Doesnt it always feel good to get out your decorations...and then I am always ready to put them away when the time comes. I love freshness and thats what happens when I clean up the Christmas glee! Although I never look as organized as you have shown us in this picture! your just gorgeous!